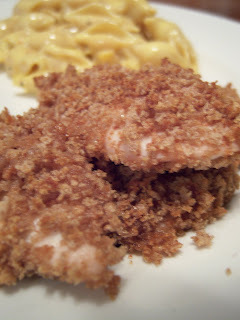 Honey and Chicken is one of mine and my husbands favorite combinations. It's always funny to me when we go to a grill type restaurant and one of us orders Chicken Tenders (ok, ususally both!) and ask if they have honey and the wait staff looks at us like we've had too many beers. Nope, I've had a few sips of the beer you just brought me - it's just an awesome combination! When I saw this recipe in Molly's blog I knew I had to try it. Not only was it simple, but it was fantastic. Can't go wrong with that! - In shallow bowl, whisk together honey and vinegar. Set aside. I love how simple this is to make - yum! April - glad you liked them. I need to start throwing them back in the rotation more often!